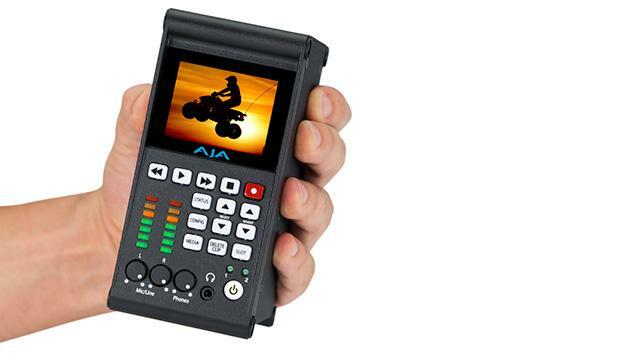 AJA Video Systems announced immediate availability of its Ki Pro Quad, a new solid-state portable video recorder enabling true 4K camera-to-editorial workflows. Ki Pro Quad enables a breakthrough 4K/Quad HD/2K/HD workflow with the efficiencies of Apple ProRes and the flexibility of RAW data in a compact, solid state recording and playback package that easily mounts directly onto a variety of cameras supporting workflow needs today and into the future. • Breakthrough 4K Workflows—Ki Pro Quad serves as a central gathering point for the main needs of 4K production; bring camera signals in and simultaneously create edit-friendly 4K ProRes files, output to 4K and HD monitors and record RAW data directly to a Thunderbolt-enabled computer/storage system. • 4K and Quad HD Support— Help ease the transition to 4K with a recorder that creates efficient file sizes while still retaining pristine quality. • More than 4K and Quad HD—Support for 4:2:2 and 4:4:4 recording even at HD and 2K resolutions, and real time scaling from 4K/Quad HD to 2K/HD. HDMI output allows connection to HD consumer monitors. HD-SDI output provides professional connectivity to high-end monitors. • Debayering and Scaling—New hardware-based features include real time, high-quality RAW debayering, recording directly to 4K resolution Apple ProRes 444 or ProRes 422 files and real time scaling from 4K to HD. • Streamlined Camera to Post—With the Canon C500: enable live debayering for immediate Apple ProRes 422 and ProRes 444 onboard recording and RAW pass through over Thunderbolt to compatible storage connected to a Mac system. With Sony F55: enable 4K 4x 3G-SDI baseband input and recording to 4K ProRes. With any SDI-capable HD camera: enable HD recording with cameras such as the Canon C300 with the added advantage of 10-bit 4:4:4 support for cameras like the Sony F3. • Affordability—Ki Pro Quad is priced substantially less than other 4K recorders but still has the power and functionality for the demands of 4K productions as well as functionality not found in competitive recorders of ANY price. • Proven Performance—Ki Pro Quad was built on the same performance principles and reliability that have made the rest of the Ki Pro family successful, and creates low-bandwidth ProRes files up to 4K resolutions, that can be easily offloaded to any Thunderbolt-enabled Mac via AJA’s new PAKDock Thunderbolt and USB3 reader. With the same capabilities of Ki Pro Mini for remote control, automation, ease of use and mounting options, the transition to Ki Pro Quad is virtually seamless. For a complete set of features and technical specifications, please visit http://www.aja.com/en/products/ki-pro-quad . Ki Pro Quad is available now from Safe Harbor at a US MRSP of $3995. AJA PAKDock, AJA Pak SSD media, and Ki Pro Quad mounting options, are now also available.